Ordered Fuzzy Numbers (OFN) were proposed about 10 years ago [7,8] as a tool for the calculations of imprecise values represented by fuzzy numbers. Calculation methods based on this model shall retain properties of operations known from real numbers. In addition, in contrast to the classic operations on convex fuzzy numbers, making a series of operations in accordance with the OFN model is not doomed to greater and greater imprecision of the results. Apart from good computational properties, OFNs also offer new possibilities for imprecise information processing by using fuzzy systems. [13,14,18] show examples of systems and the various proposals for methods based on the new model. There is a range of work [20,21,23], which focus on implications or inference operators. In the works [10,23,24,29] various aspects of defuzzification were analyzed. Little attention has been paid to aggregation of premises of rules based on OFN so far. 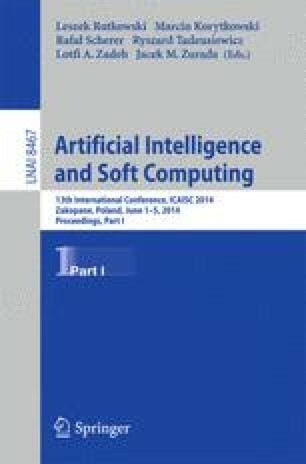 Therefore, the aim of this paper is to propose effective aggregation operator which will generate good results as well as being intuitively consistent with the idea of the new model. Moreover, the proposed solution maintains the expected properties of the aggregate functions [6,16], it takes into account key idea of OFN the direction of components.